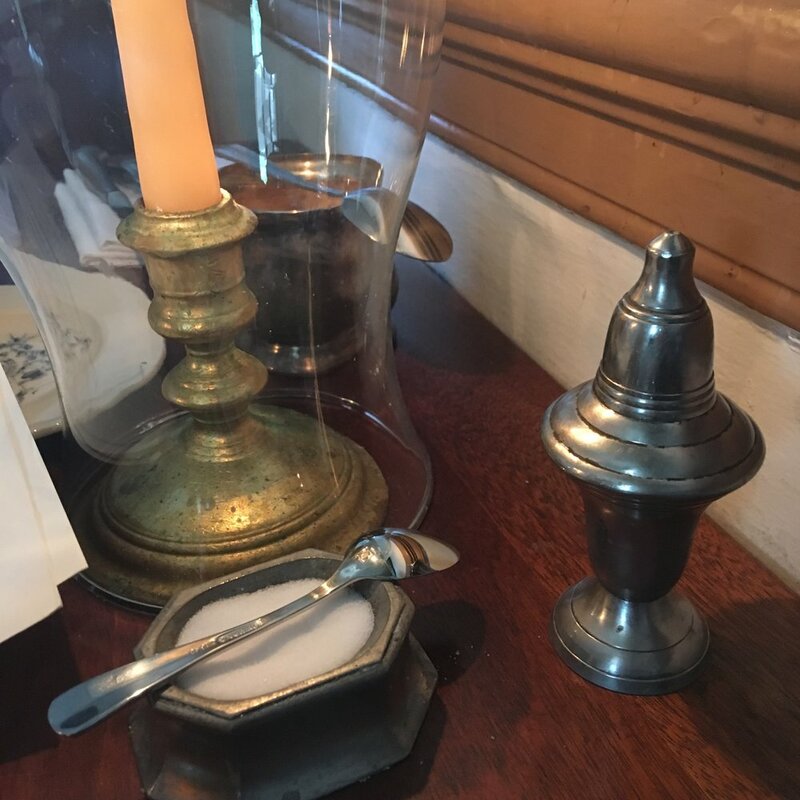 When we were having lunch at the King’s Arms Tavern in Williamsburg over the weekend, I was struck by a couple of things, which I mentioned in Saturday’s post and wanted to explore a little more here. When was the last time the power went out at your house? Do you remember how inconvenient it was, and how many times you instinctively tried to flip on light switches before you remembered that the power was out? Did it feel darker inside, even in the daytime? Did you notice how quiet it got, indoors and out: no humming of the refrigerator or swish-swish of the washing machine; no A/C units buzzing like a hive of angry wasps outside, or music bee-bopping over the iPod dock inside. Did it all feel a little eerie? This darker, quieter scene would have been normal for the colonial Americans who lived in Williamsburg—they would have most likely been freaked out by all the strange noises of modern life (shrieking sirens, anyone?). When you walk inside any of the old buildings in Williamsburg, you’ll notice that it is pretty dim inside. These historic buildings all have lots of huge windows—many more than modern houses are built with today, in fact—but there’s only so much light that ever comes in, leaving the rest of the place kind of dark. Adding to this, many of the colonial buildings (those built by the wealthy, anyway) sport dark wood paneling (I don’t know if they used walnut, cherry, or oak, maybe all three) and it’s really gorgeous. Having wood paneling on your walls was the 18th century version of having granite countertops and stainless-steel appliances in your kitchen! The wood paneling definitely soaks up light, though, leaving the rooms a little gloomy. As an aside (and with Halloween coming up), I think ghosts and haunted houses pretty much went out with Edison—too bad! Maybe modern ghosts are unemployed, finding it too hard to scare people anymore (what with all the glaring electric lights these days). Also, there’s so much truly terrifying stuff in the world today (terrorists, mass shooters, ravaging wildfires, Stephen King novels, horror films) that today’s ghosts face stiff competition. Perhaps we modern folks are just immune to a good scare, having been scared to death daily by the media. Telling ghost stories used to be a major form of entertainment…now we watch TV…just not the same. Anyway, to solve their lighting problem, the colonists used beeswax and tallow candles, as well as any light that came from the wood-burning fireplace (the cozy smell of wood smoke still fills the air in Williamsburg). Now, we all know what happens when fire and wood-frame (and often, wood-shingled) houses meet up: nothing good at all. House fires were extremely common back in the day, as you can imagine, and without modern firefighting methods the places burned to the ground with predictable monotony. (One more reason to take cookies to your local fire station!) An example of this is the Governor’s Palace, which burned down in December 1781 and lay in ruins for over 100 years, until historic preservationists luckily began restoration efforts in the 1920s. The interiors of the houses in Williamsburg are also very, very quiet, save for the noise of tourists (like me) tramping through. There was no iPod playlist for your day-to-day life in Williamsburg, unless you counted the echoing clip-clop, clip-clop of horses’ hooves as they passed by on cobblestone streets, accompanied by the thwack-thwack of steel-rimmed carriage (or cart) wheels as they bumped along, the carriages bearing the wealthy, the carts bearing goods, supplies, and the rest of us. Or the creaks and pops of your house, settling in on its foundation (wait—was that a ghostly footstep in the attic?). Or the tune of a fiddle, playing a popular melody like Over the Hills and Far Away. You don’t see them quite as much today in Colonial Williamsburg, but there would also have been chickens (and other farm animals) all over the place, filling the streets and yards with their respective animal voices. Her tavern was incredibly popular, attracting the likes of George Washington and Thomas Jefferson. Today, the King's Arms has been restored to its original glory, and features 18th century menu items such as A Made Dish of Beef and Mrs. Vobe's Southern Fried Chicken. Since the inside of the tavern is done in dark wood panelling, the light coming through the wavy glass windows needs to be enhanced by candles burning brightly at every table. The waiters all dress in period clothing, and are friendly and great with kids--a fun and entertaining part of the dining experience. During our lunch, a musician wandered through the various dining rooms of the King's Arms, playing tunes on a fiddle (with a lively "Pop Goes the Weasel" especially for the kids). Step back in time with these photos from the King's Arms! From the top: the front of the King's Arms, from historic Duke of Gloucester Street; stairs in the entryway going to dining rooms on the second floor; imposing fireplace in the parlor and coat of arms (the king's, of course) bearing a lion and a unicorn, along with the dual mottos "God and my right" and "Shame on he who thinks evil;" china cabinet in the front parlor; lunch menu; salt cellar, pepper, and sugar bowl ("the salt's white, the sugar's brown," cautioned our friendly waiter); a lunch of Norfolk Pottage Pie; photos of the dining rooms on the second floor of the King's Arms; a curious framed print on the wall of the dining room, a reprint of a 1772 caricature entitled "The Hopes of the Family: an Admission at the University"; a view from the second floor looking over the courtyard and gardens behind the tavern; and a surprise appearance by the talented Colonial Williamsburg Fifes & Drums on Duke of Gloucester Street. For further reading about Colonial Williamsburg, please see my write-ups of the Governor's Palace and the Colonial Garden & Nursery.